Yes it’s that time of year again, when kids across the country are excitedly choosing their new stationery for the new school year and parents are patiently queuing in Clarks for new school shoes. One of the must-have photos of your child is them in their uniform on the first day of the new school year. But with everything else going on in the morning with making sure they are dressed (and don’t have cereal down their jumpers! ), photos often drop to the bottom of the list. I wonder how many children nowadays will just end up with a quick iPhone snap of them on their first days that never even gets printed off? 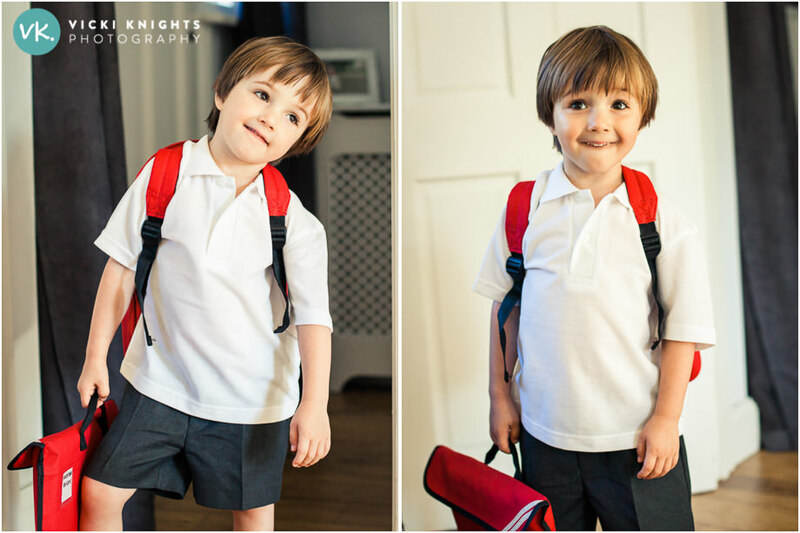 It’s a great idea to take your child out at the end of the summer holidays to take some photos of them in their school uniforms. You never know how much time you will have on the first morning of school, and your priority must be making sure they go in happy rather than being stressed about taking photos….so it’s great to know that you’ve already taken some if necessary! 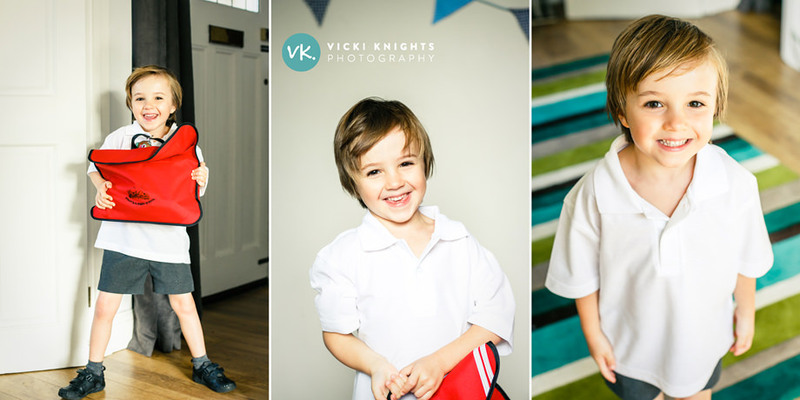 Most children get excited about trying on their new uniform, so take advantage of that and let them dress up in it a few days before the first day of term, then you can get some lovely photos of them without the stress of getting them into school on time! 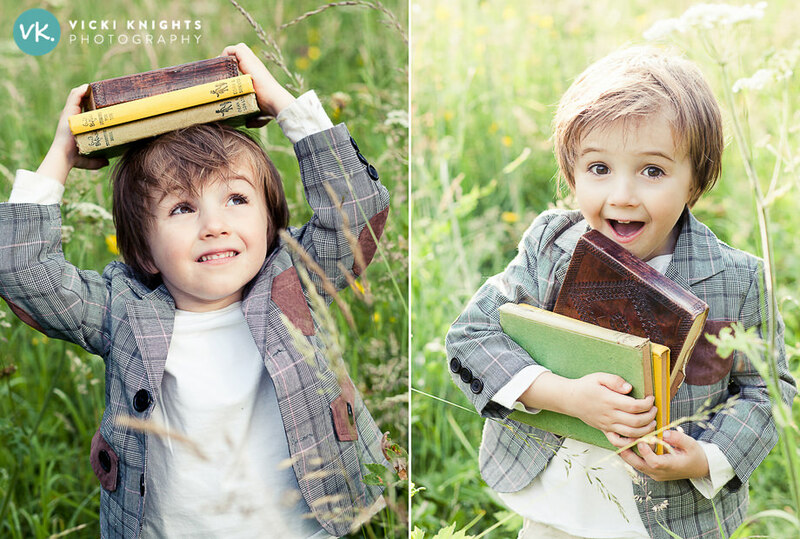 When my eldest was starting in reception, I took him down to our local fields and did a special shoot with him using vintage books and a shiny red apple. I will always look back at these photos and smile at my little boy when he was still just a pre-schooler. You can see lots more images here from this back-to-school-shoot. It sounds obvious but in the excitement (and chaos!) of getting everything ready for school it’s easy to forget to get your camera ready. So the night before, make sure that your camera battery is charged, your memory card has space and you put your camera in an accessible place so you are ready to grab it at the right time. I know I always go on about how important light is, but it really is crucial to taking great photos. If you are taking the photos indoors, make sure you have your back to the window and your child is facing it. This before and after example from a recent workshop attendee shows the difference buy amoxicillin this can make to your photos. On the left the girl has her back to the window, hence making her face very dark, but on the right she is facing the window. 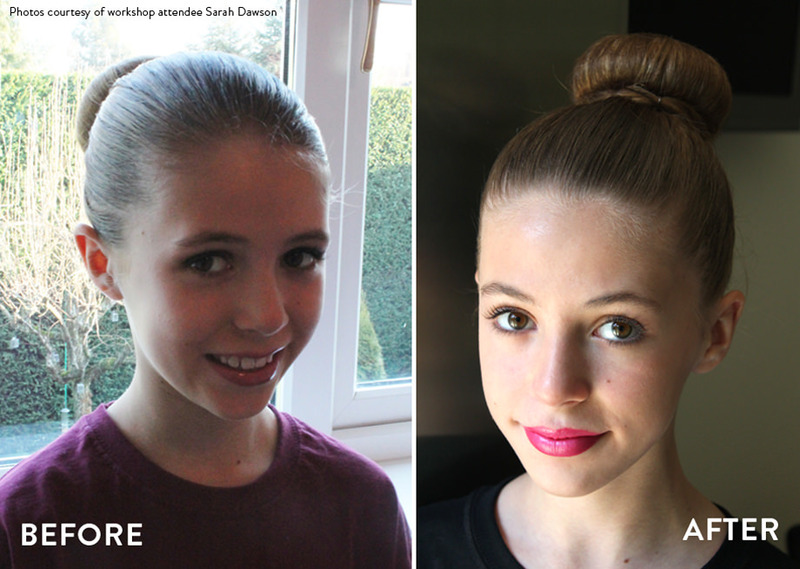 There are other factors that contributed to the huge difference you can see here, as the mum had attended one of my Photography for Parents workshops, but the main difference here is in the lighting. A great place to take photos is in a doorway as the light is always lovely and soft and you won’t struggle with your shutter speed even if it’s a gloomy day. Just stand your child in the doorway and stand outside shooting back into the doorway. For those of you who have seen my free video training with my tips for getting natural expressions, you will know why I never say ‘cheese’ to my children. Instead of getting a forced smile and unnatural pose, just ask your child questions about school and snap away while they are answering. I wish I could remember what I asked him to get the expression on the right! Natural expressions like this always show your child’s true character so much better than those forced cheesy grins! Don’t just stand in one position and snap your photos. Take a full length shot to show your child’s full uniform, and also take close up shots. Try shooting from below them and also from above. 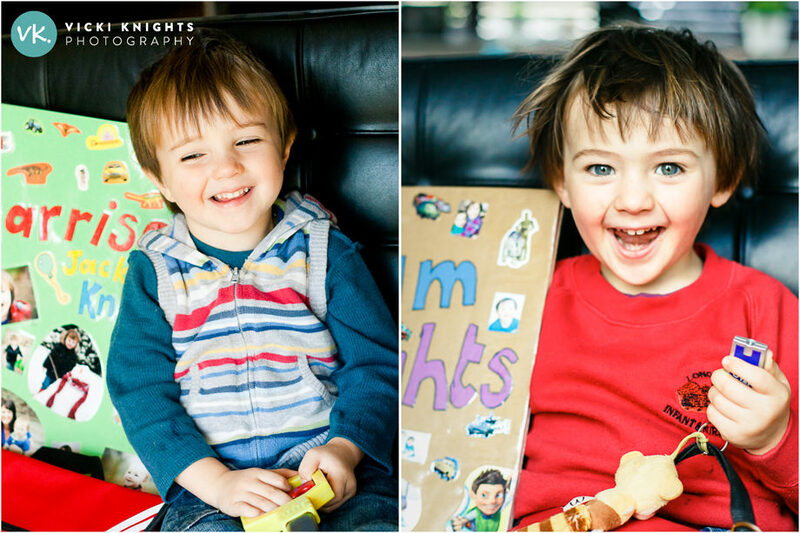 Then you’ll get a great variation of photos like the three shots I took below when my eldest was starting in Year 1. By taking photos in the same place each year, it provides a wonderful record of how they have changed from year to year. I did this with my boys on their first days in nursery. So I could put both photos together and see them both at the same stage of their lives in the same spot. 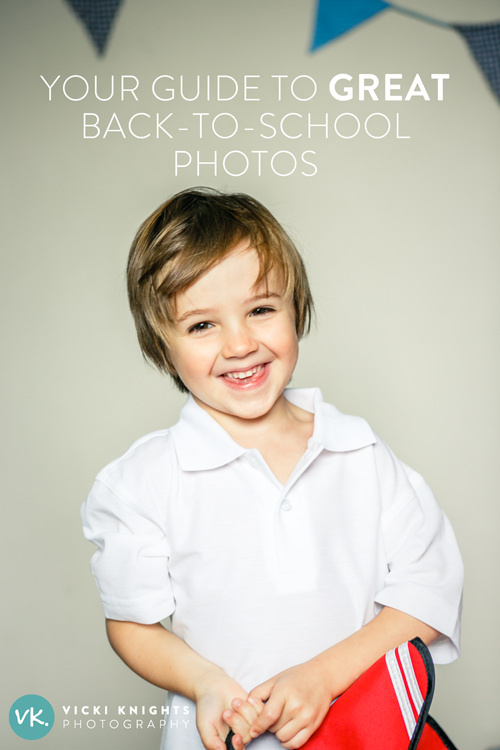 I hope you’ll find these tips useful and you take some great back-to-school photos of your children! If you want to learn how to take great photos of your children in all situations, I would love you to join us on one of my half-day Photography for Parents’ workshops in Surrey. And don’t worry if you’re not local to Surrey or can’t make the date…. I also have an online photography course for beginners that you can take from the comfort of your own home! Also make sure you sign up to my free video training to get my secret tips for getting natural expressions in your own family photos, no more cheesy smiles! Hope you manage to take some lovely shots Lucy!